ABC: THE BACHELOR gained 0.2 to 1.8, while THE GOOD DOCTOR slipped 0.1 to 1.1. CBS: BIG BROTHER: CELEBRITY EDITION dropped 0.3 from last Monday to 1.1, and MAGNUM PI stayed at 0.7. The night ended with a BULL rerun at 0.6. NBC: AMERICA’S GOT TALENT rose 0.2 to 1.8, and MANIFEST was steady at 1.0. FOX: THE RESIDENT (0.9) and THE PASSAGE (0.9) were each down 0.1. 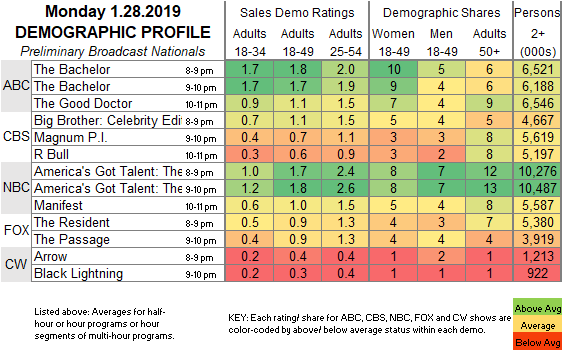 CW: ARROW (0.4) and BLACK LIGHTNING (0.3) were steady. 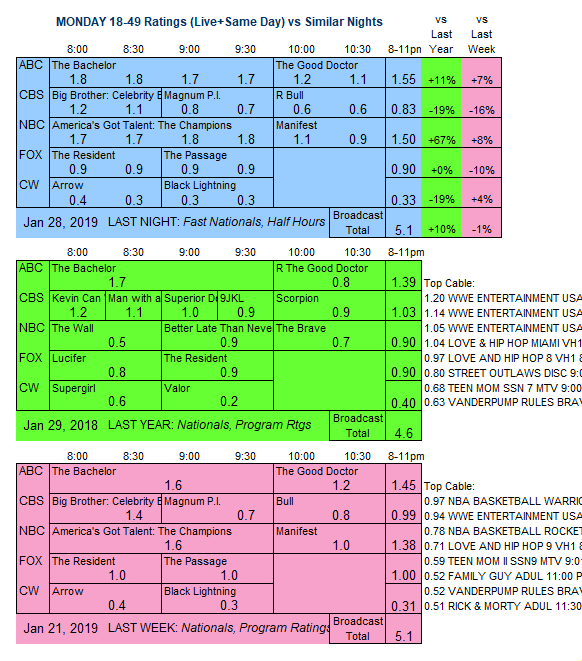 Because tonight was the original date scheduled for the State of the Union Address, the networks had to scramble when the speech was postponed, leading to a line-up tonight heavy with reruns.